For other places called Hamstead, see Hamstead (disambiguation). 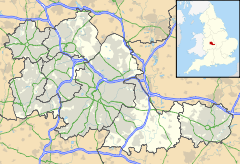 Hamstead is an area straddling the border of Birmingham and Sandwell, England, between Handsworth Wood and Great Barr, and adjacent to the Sandwell Valley area of West Bromwich. The Hamstead Colliery was worked from the early to mid 20th Century with a lot of housing built for the miners. Today it is still referred to as Hamstead Village. The River Tame enters Hamstead after passing through Sandwell Valley, and runs through the village before exiting into Perry Hall Park. It is the largest tributary of the River Trent but is not navigable. St Paul's Church, Hamstead was consecrated in 1892. There is also a secondary School, Hamstead Hall Academy. The Tame Valley Canal runs through Hamstead Village near to the old colliery site. Coal used to be transported from Hamstead Wharf near Spouthouse Lane along the canal to the Grand Union Canal and onwards. Route 54 runs from One Stop Shopping Centre (Birmingham City University; City North Campus) - Hamstead. It is known as the 'Hamstead Villager', and is operated by National Express. Route 46 (formerly 406) runs daily from West Bromwich Bus Station - Scott Arms via Sandwell Hospital. Journeys extend to Pheasey via Netherhall Park on a half-hourly basis during the day, journeys are also extended from West Bromwich to Londonderry via Galton Bridge on a half-hourly basis during the day. Services are operated by National Express. Route 424 runs from Birmingham city centre - Old Oscott, via One Stop Shopping Centre (Birmingham City University; City North Campus), and Scott Arms. Services run hourly until 6pm, Monday - Saturday. Buses are operated by Claribels Buses. The area is served by Hamstead railway station on the Birmingham-Walsall Line, part of the former Grand Junction Railway, opened in 1837. Trains run half-hourly in both directions, from 0530 until 0000 seven days a week. Trains are Operated by West Midlands Trains. Francis Asbury (1745 – 1816), one of the first two bishops of the Methodist Episcopal Church in the United States. John 'Brummie' Stokes, soldier and mountaineer, born in Hamstead in 1945. Wikimedia Commons has media related to Hamstead. ^ "Updated: Tributes paid after SAS legend dies". Hereford Times. 12 January 2016. Retrieved 12 January 2016. This page was last edited on 13 April 2019, at 10:04 (UTC).